Climate change took a backseat to other issues in this year’s midterm elections, and humanity may end up paying the price. The majority of climate change-related ballot measures failed, many climatedeniers in the Republican party won or kept their seats, and even Democratic winners were not pressed on their commitment to climate change legislation during their campaigns. In their minimal and skewed coverage of climate change issues, the media deserve a share of the blame for these losses. The initiative would have accomplished the first step of what manyclimate scientists and activists say is one of the most effective actions for mitigating climate change: putting a price on carbon dioxide. 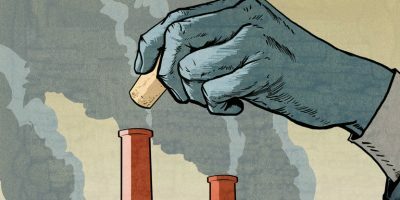 Prices on carbon ranging from $50–100 per ton have been put forth by the World Bank as reasonable for achieving the goals of the Paris Climate Agreement, while a figure of $220 per ton has been found to more accurately represent the actual social costs of carbon. While I-1631 would have priced carbon at only $15 per ton in 2020, with annual increases that would top it out at $55 per ton, it would nonetheless have been the first explicit and substantial statewidecarbon pricing initiative in the United States. Media Matters (11/2/18) detailed how oil companies like BP, Phillips 66 and Koch Industries gave over $31 million to industry trade groups like Western States Petroleum Association to shoot downthe measure. I-1631’s diverse coalition of advocates raised half that amount. The fossil fuel company’s “No on 1631” campaign also spent $1.1 million on countless Facebook ads and $6.2 million on dozens of local television ads. The companies benefited from a slew of op-eds and editorials urging voters to vote no on I-1631, including pieces in national newspapers like USA Today (11/4/18) and Wall Street Journal(10/21/18) and local dailies like the Seattle Times (9/21/18, 10/20/18, 10/25/18), Spokane Spokesman Review (10/23/18) and Everett Herald (10/14/18), along with dozens of other opinion pieces in local newspapers. Some of the authors had fossil fuel industry ties. As Media Matters (10/31/18) pointed out, the initiative’s defeat was assisted by a torrent of negative coverage in national right-wing outlets like the Wall Street Journal (10/19/18), Washington Free Beacon (8/22/18), Washington Examiner (9/21/18) and Daily Caller(8/22/18, 10/17/18, 10/25/18, 10/31/18, etc. ), who used combinations of APS-funded studies and scaremongering about Steyer, who, being a Jewish billionaire like his fellow right-wing boogeyman George Soros, is a frequent target of antisemitic conspiracy theories. 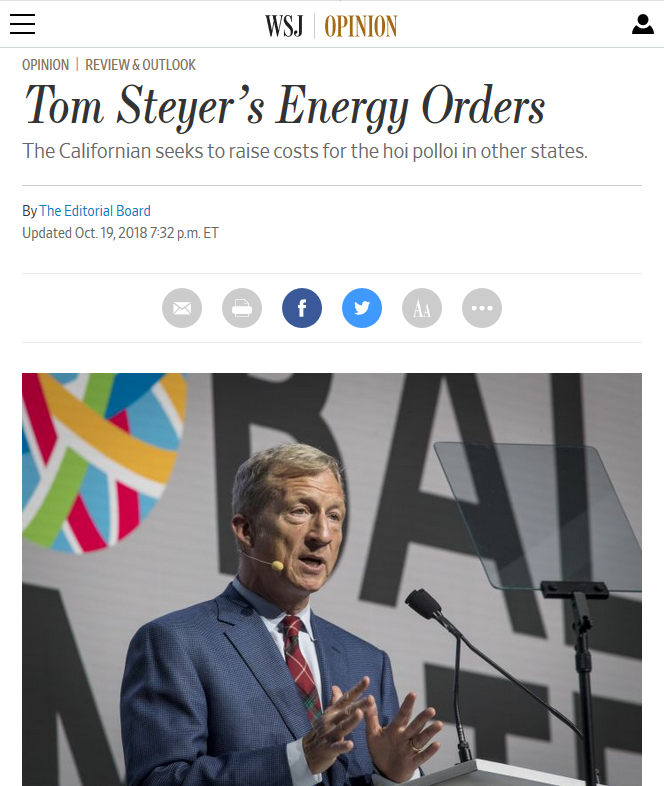 Much of the right-wing media campaign against Arizona’s Prop 127 focused on billionaire Tom Steyer (Wall Street Journal, 10/19/18). Despite the public’s apparent support of the measure prior to the election, Proposition 112 received strikingly unified opposition from the state’s newspapers: The measure was attacked and dismissed by the editorial boards of the Denver Post (10/10/18), Colorado Springs Gazette (10/1/18) and Aurora Sentinel (10/1/18), while other anti-112 op-eds appeared in numerous other local papers in the state. Media Matters (11/5/18) noted that none of the newspapers that took a position on 112 mentioned climate change in their editorials, save the pro-112 Boulder Daily Camera (10/2/18). While major newspapers like the New York Times often do solid reporting on climate, cable news networks hardly ever dedicate segments to climate change, and when they do, they are usually within a presidential context. In 2017, almost all of cable news networks’ mere 260 minutes of coverage on climate change revolved around Donald Trump—mostly on his announcement that the US would pull out of the Paris Climate Agreement. In their reporting, those networks often did not even challenge Trump’s frequent claim that climate change is a hoax, a failure that has long plaguedthe major networks. Climate deniers still even get guest spots on networks like PBS and CBS, who actually do better than the other major networks in covering climate change. Justin Anderson is a writer based in New York City. You can follow him on Twitter at @_JustAndFair.